Available from Agilent Technologies , 33521A 1-channel and 33522A 2- channel function/arbitrary waveform generators are members of the Agilent 33500 Series family. These waveform generators provide low total harmonic distortion and jitter while the large graphical display allows for simultaneous parameter setup, signal viewing and editing. These waveform generators also offer precise functions and true point-by-point arbitrary waveforms that are alias-protected for outstanding accuracy. Agilent’s 33521A and 33522A function/arbitrary waveform generators are entirely compliant with the LXI Class C Specification and include USB 2.0 and 10/100 Base-T Ethernet (LAN) for fast and simple connectivity to a PC or a network. A built-in Web page allows remote operation of the waveform generator instrument from any browser. 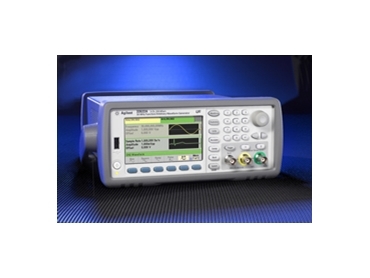 The 33500 Series of waveform generators can connect with Agilent's current line of function/arbitrary waveform generators (33210A, 33220A, 33250A) using the GPIB interface option.